Chanel black quilted lambskin maxi single flap with silver tone hardware. Shoulder drop 11"/21". Collection 2009/2010. Comes with hologram and original box. Bottega Veneta new condition black leather intricate bag with top zipper. 15" handle drop. Comes with original dust cover. 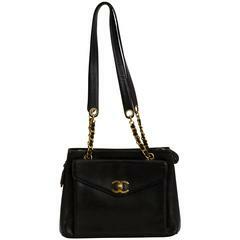 Chanel maxi single flap in black lambskin with silver tone hardware. Origami original quilting. Shoulder drop 8". Comes with hologram and dust cover. "Kan I" small shoulder bag in black Fendi leather with scalloped flap embellished with maxi white pearls, sliding strap in silver chain and internal suede.